You know The Who song, Pinball Wizard? It went through my head most of the time I was touring Budapest because I knew I was making a stop at the Pinball Museum, or Flipper Museum as it’s locally known. What I didn’t expect was to learn how invasive pinball wizardry still is today. It seemed like a thing of the past. “We call them time machines,” Mark Pataki, the Business Development Manager explained. Indeed. They take people my age back to the glory days of our youth and it transports children into a bit of history that they missed, and they love it! It’s something tangible that they can play as opposed to modern-day video games that you only interact with in their specific virtual worlds. Anyone who grew up playing pinball machines in arcades knows exactly what I’m talking about. Your whole body plays pinball as soon as you pull the knob that lets the springs shoot the magical silver ball out of the gate. It rolls and hops across the decorated board, ringing and dinging while you play. You push your body forward into the machine. You veer left and right as the ball ricochets off the rubber-band bumpers in defiant motion against the pull of the downward sloping board. Many a time, I stood beside my boyfriend, watching him grunt and shove against the machine, his tongue poking out of his mouth like a child concentrating on a coloring book. He’d jerk and twist, engaging his shoulders, hips and jabbing fingers as he machine-gunned pressed the flipper controls. Sometimes I had to get out of the way and let him have more space. Eventually, the ball would finally escape his grasp and fall into the gutter. Then it was my turn. A minute later, my boyfriend was back at the helm. 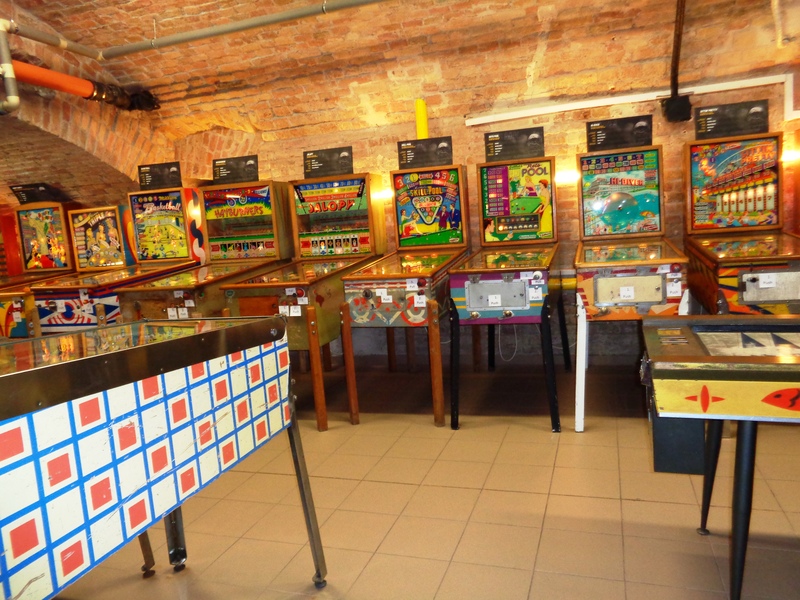 If you can relate to this at all, the Pinball Museum in Budapest is a must-see. It contains the biggest continuously interactive collection in Europe. 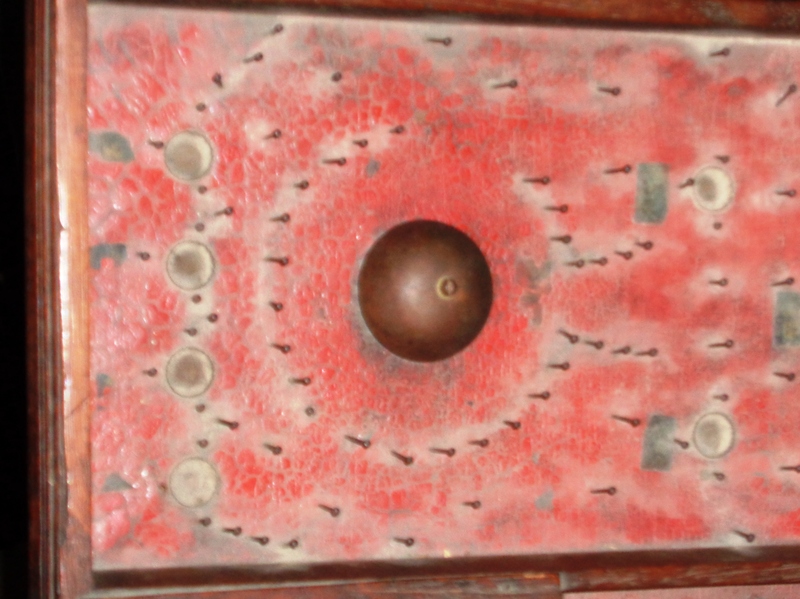 Some of the machines date back to the 1930’s and 40’s when balls were dropped onto a board framed with actual pins instead of the rubber bumpers of today. 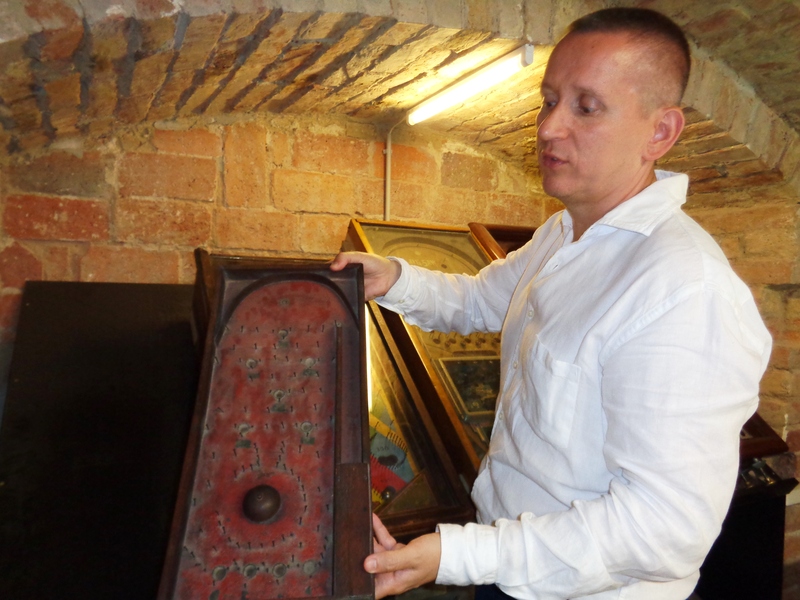 The museum was created years ago when owner Balázs Pálfi realized that he had more than 20 pinball machines at home. He wanted to make them available to the public and not just serve his own entertainment needs. He’d always been fond of graphic design, which is a crucial part of pinball, along with all their enchanting sounds, colors and movement. Mark shares a true “pin”ball machine with me. Each of the 115 pinball machines in the museum has a placard that details specifics most of us would never think about: the year it came out, the artist who designed it, and the game company that owned it. All of the machines are maintained by skilled electricians who also need to be something of an artist since the character of the machines need to be restored much like museum paintings. The great thing about the museum is that you go in, pay your admission, and then are welcome to play on ANY of the machines there. Since most (if not all) of the machines were produced in the United States, they take quarters. But instead of doling out quarters to visitors, the machines have been activated to play without money. Just find the machine(s) that interest you, pull the knob, and let ‘er rip! Of special note is the Hercules game. It is the biggest pinball machine ever made. The balls are the size of billiard balls and while the game can’t be played anymore, it warrants a view. It dwarfs the machines around it. A fun fact: it took 170 lbs. of packing materials to ship it to Europe. I can’t even imagine. You can see how Hercules dwarfs the others. 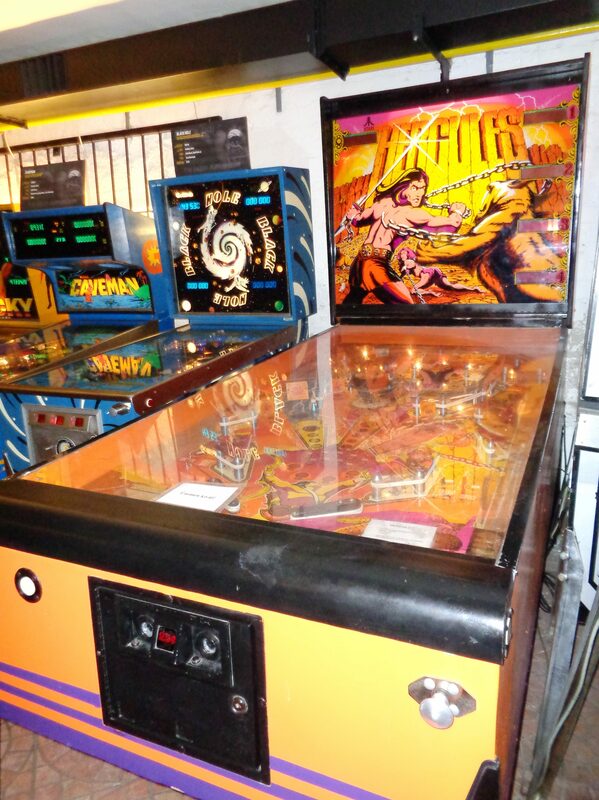 Many of the people who visit the museum are Americans nostalgic for their “Pinball Wizard” pasts. 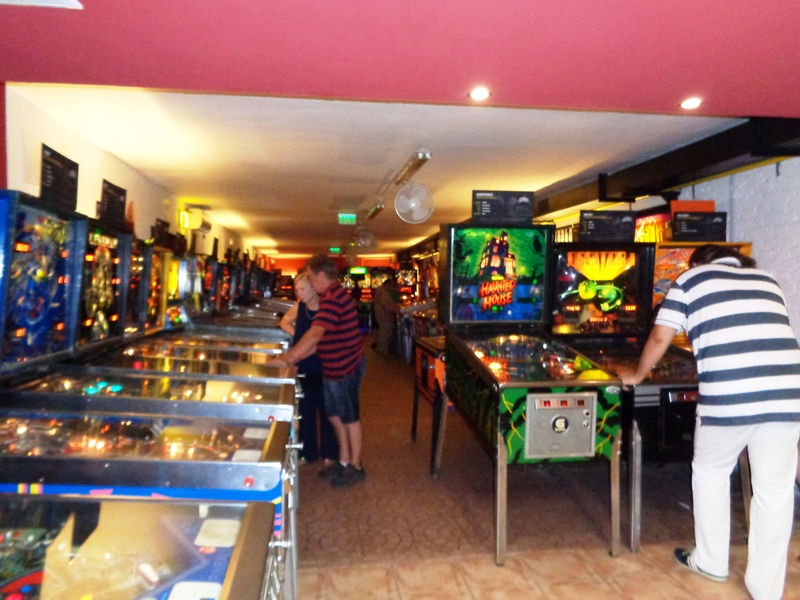 But plenty of Europeans have become pinball wizards, too. In fact, they’ve become Pinball Champions. The U.S. may have created the machines, but other parts of the world have embraced the challenge of keeping that metal ball from dropping. ARCADIA, one of this year’s biggest retro arcade game exhibitions in Europe, will take place November 18-20 in Budapest. Apart from its main organizer, Budapest Pinball Museum (the biggest ongoing interactive pinball exhibition in Europe) and Arcade Hry (the biggest video arcade museum in Europe) from the Czech Republic, the Krakow Pinball Museum will also contribute to its complexity, together with Austrian and Hungarian collectors and distributors. Who knew that being a Pinball Wizard was so universal? Certainly not me. But I loved stepping into the Pinball Museum and taking that step back in time to my teen-aged years. 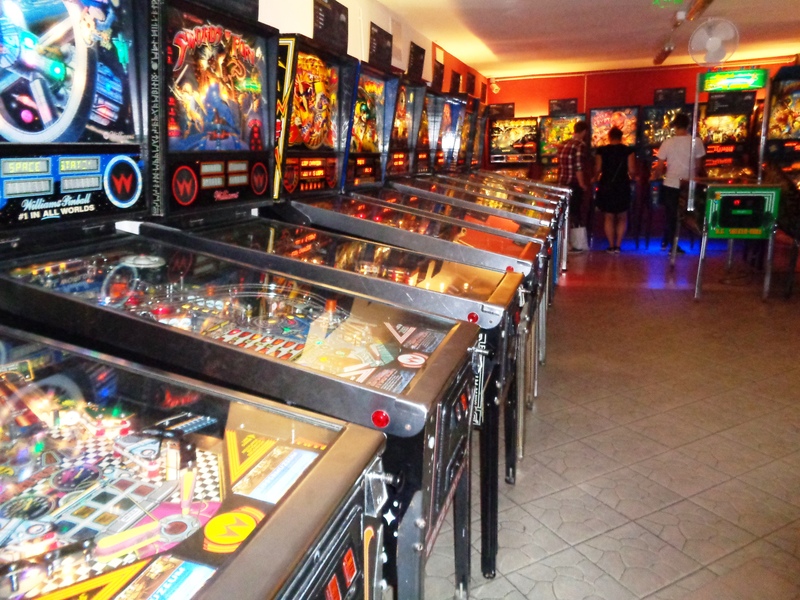 Which appeals to you more: pinball machines or video games? And why? What a fantastic and unique museum! It was! Such a blast from the past. Something I hadn’t thought about in years. Brilliant. We never realised that we were playing on machines that would soon be consigned to history. A few kids were indeed wizards but I was invariably rubbish. Every cafe and coffee joint had to have at least one machine in the 70s or risk having no customers. I know. I can’t help but wonder if they’ll come back around. Like vinyl record albums. They’re cool to have again.